They want to feel as though their opinions, feelings and individuality matter, and one of the easiest and most effective ways to do that is by connecting with them on a personal level on social media. 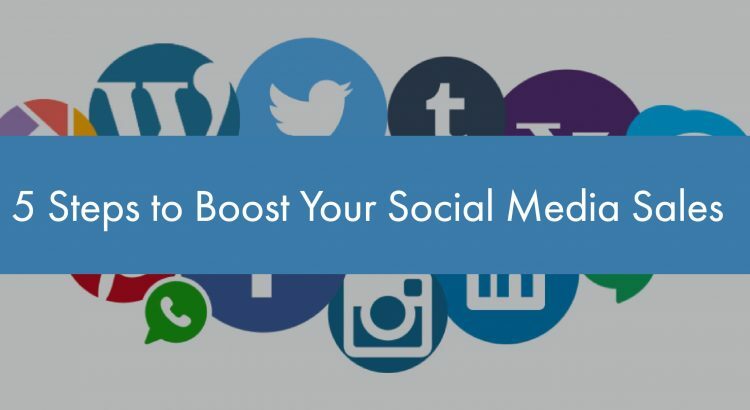 Get in on this growing phenomenon that shows no signs of slowing down, by implementing these 5 steps to boost your social media sales. It’s always best to approach a new contact with a shared interest of common background. That way, it’s not just a random conversation you’re starting for no reason. Trying to open up a dialogue with someone you don’t know, whom you’ve never met can be difficult as it is. But, it’s made even more difficult if you aren’t making a connection on some level, and simply coming off as salesy. If you’re in the same city, went to the same college or have some hobby that’s the same, those are all great opportunities for opening up the lines of communication with a potential customer. While many on LinkedIn are out there seeking employment, you’ll want to create a profile page that cements yourself as an expert in the field. You don’t want to be seen as someone who is looking for validation from others, but rather someone who is sought after for their expertise and advice. Present yourself as the expert everyone turns to for the answers, and approach your contacts as such. If you’re looking for some help in putting together a dynamic and engaging LinkedIn page, that properly reflects the tone of your persona, Australian Reviewer is filled with writers who are ready and available to help in any way possible. Staying active on Twitter means keeping up with discussions and responding in real time to those posts related to your field. You’ll want to publish a good mix of posts featuring your own thoughts as well as information from other sources. Being an authority on a subject not only means you’re able to speak to that subject yourself, but it also means you’re able to provide outside sources of information that are helpful and reliable. The ratio should be about one original tweet from your own words to three tweets from outside sources. Don’t just present your own information as the main source that’s available. Show that you’re willing and able to recognize other reliable sources of information, and provide your audience with those sources. For a library of content with strong editorial standards, Inc is a great place to start your search. Of course, social selling is an excellent resource for sales representatives to seek out and find new prospective leads. But it’s so much more than that. There are a number of ways you can make yourself back onto someone’s social media radar after they’ve started to fade in the interest they’re showing you. Retweeting someone or commenting on one of their posts is a great way to reopen a conversation with them and jump back into their radar. Retweeting someone also demonstrates that what they’ve got to say is relevant enough to your subject that you find it important to retweet that information. It’s a way of connecting with them and showing them that you’re listening to what they’ve got to say. Yes, it’s true the monitoring social media happenings is predominantly a marketing endeavor. But, it’s been shown that there are great benefits for those sales reps who are putting forth the effort to monitor, track and engage in conversations in a relevant and meaningful way. Stay active and engaged in what people are talking about throughout your social media outlets. In the same way, the focus cannot solely be on those contacts who are the most likely to become customers. If that was the case, you would be limiting yourself tremendously. Keep in mind that in the social media world, it’s easy to share information. So, even if your contact isn’t going to buy anything themselves, they could be more than willing to share the information you have with others who would be more receptive to buying. By opening up real conversations and connecting with prospective customers on a more personal level, you’ll be able to increase your social media presence, the authority you demand on the subject and the sales you’re seeing. Put these 5 tips into play in order to help make this happen. Rachel Summers has been a social media manager for seven years, working for a variety of companies, both big and small, a leading custom writing service. In his freetime, Rachel also helps and advices a variety of small and start-up businesses on their social media strategies.